Windows 98 or above (i.e. ME, 2000, XP) with a rewritable CD-ROM or a 1.44MB floppy drive. Approximately 40 MB free hard drive space. *Please READ Fundcraft's Free Short/Cut™ Software License! Before continuing, please read the following Software License Agreement. By clicking on the "I Accept" link below, you are consenting to be bound by this agreement. If you do not agree to all of the terms of this agreement, click on the "I Do Not Accept" link below and you will be returned to the SHORT/CUT™ page. SHORT/CUT™ END USER LICENSE AGREEMENT GRANT. 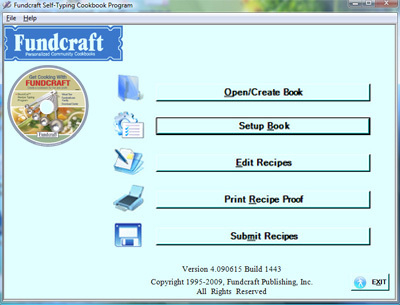 Fundcraft Publishing, Inc., grants you a non-exclusive license to use the Software free of charge. You are not entitled to hard-copy documentation, support or telephone assistance. DISCLAIMER OF WARRANTY. Free of charge Software is provided on an "AS IS" basis, without warranty of any kind, including without limitation to the warranties of merchantability, fitness for a particular purpose and non-infringement. The entire risk as to the quality and performance of the Software is borne by you. Should the Software prove defective, you and not Fundcraft assume the entire cost of any service and repair. This disclaimer of warranty constitutes an essential part of the agreement. SOME JURISDICTIONS DO NOT ALLOW EXCLUSIONS OF AN IMPLIED WARRANTY, SO THIS DISCLAIMER MAY NOT APPLY TO YOU AND YOU MAY HAVE OTHER LEGAL RIGHTS THAT VARY BY JURISDICTION. Download complete ShortCut™ Instruction Manual, as PDF . "You Collect the Recipes and Fundcraft Will Do the Rest!"